Chapter 2: What Makes a Good Leader, and Does Gender Matter? Whether they are heading a major corporation or serving in elected office, leaders bring a combination of traits to the table. In the public’s estimation, some traits are clearly more important than others. Honesty, intelligence and decisiveness are considered “absolutely essential” leadership qualities by at least eight-in-ten adults. Roughly two-thirds of adults (67%) say that being organized is an essential quality in a leader. Somewhat smaller shares of the public say that being compassionate (57%), innovative (56%) or ambitious (53%) are essential for leadership. 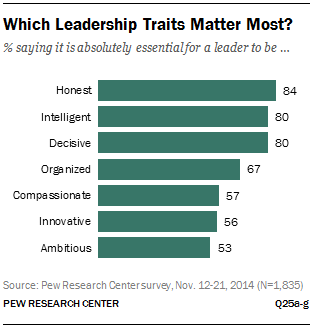 Men and women tend to agree on the relative importance of the top tier of leadership traits. Nearly equal shares of each say being honest, intelligent, organized and decisive are absolutely essential, although women place somewhat more importance on intelligence and honesty than do men. Larger gender gaps emerge on some of the other, less important traits. Women are much more likely than men to say that being compassionate is absolutely essential in a leader: 66% of women say this, compared with 47% of men. Women also place a higher value on innovation than men do. Some 61% of women consider this trait to be absolutely essential in a leader, compared with 51% of men. In addition, women are more likely than men to say that ambition is an essential trait for a leader (57% of women and 48% of men say this is absolutely essential). This overall gender gap is driven by the younger generations—Millennials and Gen Xers. Fully 63% of Millennial women and 61% of Gen X women consider ambition an essential leadership trait, compared with 53% of Millennial men and only 43% of Gen X men. Who Has the Right Stuff to Lead—Men or Women? The public sees little distinction between men and women on several of these leadership traits. Large majorities say that when it comes to intelligence and innovation, men and women display those qualities equally. 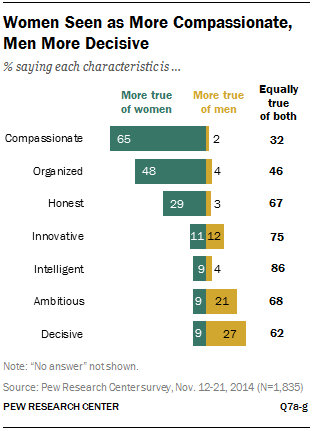 And solid majorities see no gender differences in ambition, honesty and decisiveness. The public is also much more likely to see women as being more organized than men, rather than vice versa. Fully 48% say being organized is more true of women than men, while only 4% say this quality is found more in men than women (46% say it’s true of both). Women also have an advantage over men when it comes to honesty—one of the most crucial leadership traits, according to the public. Some 29% of all adults associate honesty more with women than men, while 3% say honesty applies more to men than women. A majority of adults (67%) say this characteristic is displayed equally by men and women. Two additional leadership traits are clearly a gender tossup in the public’s mind. More than eight-in-ten adults (86%) say intelligence is equally descriptive of men and women. An additional 9% say women are more intelligent than men, and 4% say the opposite. Fully three-quarters of adults say men and women are equally innovative. Those who see a difference on this characteristic are evenly split over which gender has an advantage: 11% say innovation better describes women, and 12% say it’s more true of men. How much do these gender differences matter in the public’s assessments about who would make a better leader? Very little, according to the data. When the analysis is narrowed to those respondents who consider a specific trait to be “absolutely essential” for a leader, similar-sized majorities see no difference between men and women. For example, among those who say honesty is an essential quality for a leader to have, 68% say that men and women are equally honest (among all adults 67% say the same). And for those who say intelligence is an essential trait for a leader, 87% say this trait is found equally in men and women (compared with 86% among all adults). The same can be said of decisiveness. Among those who say this is an essential leadership trait, 61% say men and women display this trait equally (compared with 62% among all adults). Compared to their share of the population, women remain underrepresented at virtually all levels of elected office, but the new Pew Research survey findings suggest that this is not due to a lack of confidence on the part of the public. A strong majority of Americans (75%) say women and men make equally good political leaders. Some 14% say men generally make better political leaders than women, and 9% say women make better leaders than men. Views on gender and political leadership are remarkably stable across major demographic groups. Men are slightly more likely than women to say that men make better political leaders (17% vs. 12%), and women are more likely than men to say women make better leaders (11% vs. 7%). 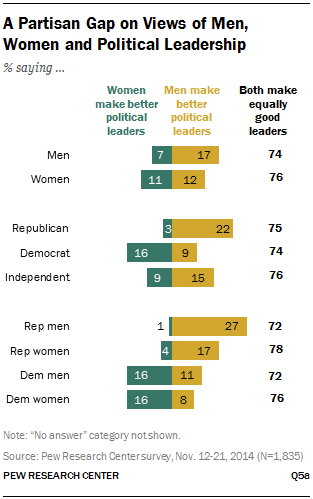 But strong majorities of both groups say men and women make equally good political leaders. There is broad agreement across generations as well, although Gen Xers are somewhat less likely than younger or older generations to say that women make better leaders than men. There are no major differences across racial or socio-economic groups on this question. Solid majorities of Republicans (75%), Democrats (74%) and independents (76%) say men and women are equally qualified for political leadership. Among those who see a gender difference, views differ by party identification. One-in-five Republicans (22%) say that men make better political leaders than women; only 3% say that women make better leaders. Democrats lean the other way, although their views are more evenly distributed: 16% of Democrats say that women make better political leaders than men, while 9% say that men make better political leaders. The views of independents fall between those of Republicans and Democrats (although slightly closer to Republicans). When gender and partisanship are both taken into account, the differences become sharper. Among Republican men, 27% say that men make better political leaders than women. Only 1% of Republican men say that women make better leaders than men. Republican women also lean toward men, though less heavily so: 17% say that men make better political leaders than women, while 4% say women make better leaders than men. The gender gap is smaller among Democrats. Equal shares of Democratic men and women say that women make better political leaders than men (16%). Among Democratic men, 11% say men make better political leaders than women. Some 8% of Democratic women say the same. In elected office, women tend to be more heavily represented in the legislative branches of government than in the executive branches, but the public doesn’t draw sharp distinctions in terms of where women can do the best job. Only 10% say women are better at legislative jobs like serving on the city council or in Congress, and 7% say women are better at executive jobs such as mayor or governor. The vast majority (82%) say there is no difference, suggesting that women can serve equally well in either type of position. A similarly large majority of adults (83%) don’t see any difference in men’s capability to carry out executive vs. legislatives jobs in government. About one-in-ten adults (11%) say men are better at executive jobs, and 5% say men are better at legislative jobs. Men and women agree that executive and legislative jobs are not better suited for one gender than the other. While most Americans think, in general terms, men and women make equally good political leaders, many do see gender differences in style and substance. One area where the public draws fairly sharp distinctions is on the ability to work out compromises. Just over half (55%) say there’s no difference between male and female political leaders when it comes to working out compromises. Among those who see a difference between men and women on this dimension of leadership, the balance falls clearly in favor of women. 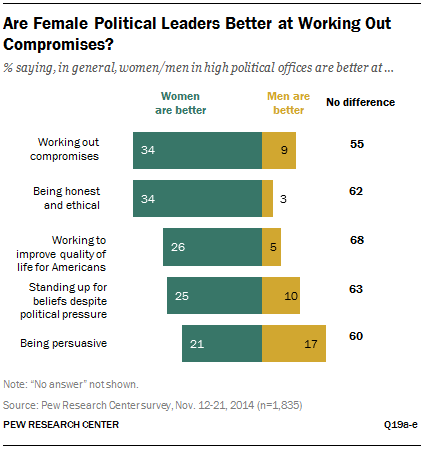 Some 34% of all adults say women serving in high-level political offices are better than men at working out compromises. Only 9% say men are better at this. Women also have an advantage over men on honesty and ethical behavior. A majority of all adults (62%) say men and women don’t differ in this regard. One-third (34%) say women in top political positions are more honest and ethical than men in top political positions. Just 3% say men are more honest and ethical. Most adults (68%) say political leaders are equally good at working to improve the quality of life for Americans regardless of their gender. But many do see a gender difference: 26% say women in top political positions are better at this than their male counterparts, while 5% say men are better at this than women. Similarly, women have an edge over men when it comes to standing up for what they believe in, despite political pressure. While most adults (63%) say men and women serving in high-level political offices are about equal in this regard, 25% say female political leaders are better at doing this, and 10% say men are better. Opinion is more evenly divided on which gender is more persuasive. Overall, 60% of adults say there is no difference between male and female political leaders in their ability to be persuasive. Beyond that, only a slightly higher share say women are better at this (21%) than say men are better (17%). There is a wide and consistent gender gap in opinions about the relative strengths of male and female political leaders. Across the board, more women than men say that female leaders are better at the attributes tested in the poll. The largest gap is on the ability to work out compromises. Fully 41% of women say that female leaders in high-level political offices are better at this; 27% of men agree. Women are also significantly more likely than men to say that in politics female leaders have an advantage over male leaders in terms of standing up for what they believe in, despite political pressure. Three-in-ten women say female leaders are better at doing this; only 19% of men agree. 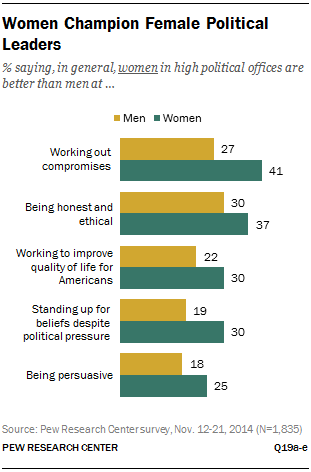 There are significant gender gaps on the three additional items tested in the poll: being honest and ethical, working to improve the quality of life for Americans and being persuasive. In each case more women than men say that female political leaders do a better job. Interestingly, while men are somewhat more likely than women to say that male political leaders excel in several of these areas, in most cases, even men give female leaders at least a slight edge. 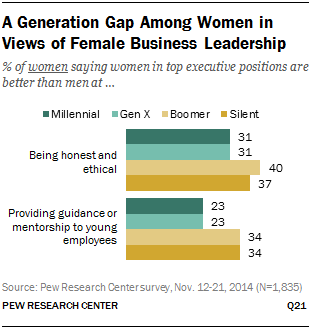 There is a generational divide in views of men, women and political leadership. Baby Boomers and members of the Silent generation tend to have more a positive view of female leaders than do their younger counterparts. And because the gender gap on these issues is much wider among older adults, the generational differences are driven almost entirely by women. About half of women from the Baby Boom (47%) and Silent generations (50%) say that women in high political office are better than men at working out compromises. By comparison, 33% of Millennial women and 37% of Gen X women say the same. Similarly, 39% of Boomer women and 35% of Silent women say that female leaders are better than their male counterparts at working to improve the quality of life for Americans. Younger generations of women are less likely to hold this view (22% of Millennial women and 24% of Gen X women). 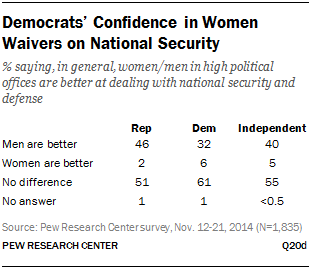 Democrats express more confidence in female political leaders than do Republicans. On each of the attributes tested in the poll, Democrats are significantly more likely than Republicans to say that female leaders do a better job than men. For their part Republicans are not necessarily more likely to favor men in these areas, but they are more inclined to say there isn’t any difference between men and women. For example, while 40% of Democrats say female political leaders are better than male leaders at working out compromises, only 30% of Republicans agree. 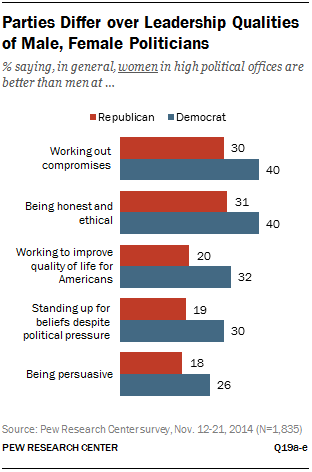 Relatively few Republicans (10%) say men are better at working out compromises, but a majority (58%) say there isn’t any difference between men and women in this regard. When it comes to standing up for what they believe in, despite political pressure, three-in-ten Democrats say female political leaders are better at this than male leaders. Only 19% of Republicans agree that women are better than men in this area. Some 67% of Republicans, compared with 59% of Democrats, say men and women are equally able in this regard. Democratic women are among the most enthusiastic proponents of female political leaders. In most cases, they are more likely than both Democratic men and Republican women to say that female political leaders do a better job than men. This is true for working out compromises, working to improve the quality of life for Americans, standing up for what they believe in and being persuasive. Just as the public views men and women as equally capable on various leadership traits and characteristics, majorities see little difference between male and female political leaders in some major policy realms. Handling the country’s economic conditions is often at or near the top of the public’s issue agenda. And most Americans (73%) say men and women in high political office perform about equally in this area. Those who do see a gender difference in dealing with economic policy split fairly evenly between men and women when assessing who generally does a better job: 12% say men are better at handling economic conditions, and 14% say women do a better job. Environmental policy is another area where the public sees little difference between male and female political leaders: 71% say when it comes to handling environmental issues, men and women perform about equally well. Roughly one-in-five (18%) say women in high political offices are better at handling this issue; half as many say men do a better job in this area. Bigger differences emerge on two additional policy areas—social issues and national security. Narrow majorities say men and women in high political office are equally capable in these areas: 57% for social issues and 56% for national security. But nearly four-in-ten have a clear gender preference in each of these issue areas. Some 38% say women in high political office do a better job than men dealing with social issues such as education and health care. Only 3% say men do a better job in this area. Opinions run in the opposite direction on the issue of national security. 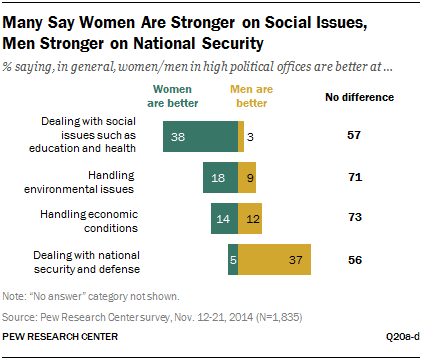 Fully 37% of all adults say men are better at dealing with national security and defense; only 5% say women do a better job in this area. There is a large partisan gap on this question, with Republicans much more likely than Democrats to say that men are better at dealing with national security (46% vs. 32%). But even among Democrats, only 6% say that women are better in this area. Democrats are more likely than Republicans to say that men and women are equally capable when dealing with national security issues. The gender gaps in perceptions about male and female leaders are not as pronounced on these policy issues as they are for traits and attributes. Women are more likely than men to say that female political leaders are better at dealing with social issues such as education and health care, and they are somewhat more likely to say that female leaders are better at handling economic conditions. Very few women (5%) say that female leaders do a better job than their male counterparts in dealing with national security. A majority of women (59%) say that there isn’t any difference between male and female leaders in this policy area (54% of men say the same). The vast majority of the public (80%) says that men and women make equally good business leaders, but many feel businesses are not ready to hire women for top executive positions. Men and women agree that both genders are equally capable of leading in the business world, and there is general agreement on this across generations and partisan groups. Looking at some of the specific attributes required to be successful in business, again, the public sees relatively few differences between men and women. Strong majorities say there is no difference between men and women when it comes to being an effective spokesperson for their company (77% see no difference) and negotiating profitable deals (73%). And solid majorities see no difference between men and women on providing guidance or mentorship to young employees (66%), providing fair pay and good benefits (64%), being honest and ethical (64%) and being willing to take risks (58%). Among those who do draw distinctions between men and women on these leadership attributes, some clear gender patterns emerge. About three-in-ten adults (31%) say women in top executive positions are more honest and ethical than men; only 3% say men are better in this regard. Similarly, 30% say women do a better job at providing fair pay and good benefits, while 5% say the same about men. Women are also perceived to have an advantage in providing guidance or mentorship to young employees: 25% say women are better at this, while 7% say men are better. The largest gap in favor of men is on the willingness to take risks. Some 34% of the public says men in top executive positions are better at this than women; only 5% say women are better than men. Men are also seen as having an edge in negotiating profitable deals. About one-in-five adults (18%) say men in top business positions are better at this than women, while 7% say women are better at this. Neither men nor women are seen as having a clear advantage in serving as spokespeople for their companies: 9% say men are better at this, 12% say women are better and 77% see no difference between the two. 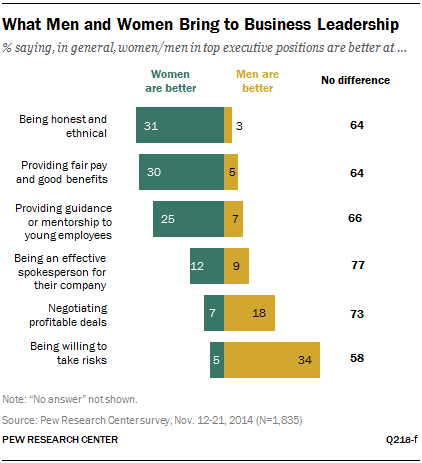 Views about men and women and their effectiveness in certain aspects of business leadership differ somewhat by gender. Women are more likely than men to say that female leaders are more honest and ethical than their male counterparts (35% of women say this, vs. 27% of men). Similarly, more women than men say that female business leaders are better at providing fair pay and good benefits (34% vs. 24%) and providing guidance or mentorship to young employees (28% vs. 21%). Men are more likely than women to say that male leaders in business are more willing to take risks (37% of men say this, compared with 31% of women). In addition, men are more likely than women to say there is no gender difference when it comes to being honest and ethical and providing fair pay and good benefits. Among women, opinions differ significantly on some of these items by generation. Boomer women stand out in their belief that female business leaders are more honest and ethical than male leaders. Fully 40% of Boomer women express this viewpoint, compared with 31% of both Millennial and Gen X women. Boomer women along with their older counterparts—Silent generation women—are also more likely than younger generations of women to say that female leaders are better than male leaders at providing guidance or mentorship to young employees (34% of Boomer and Silent women vs. 23% of Millennial and Gen X women). 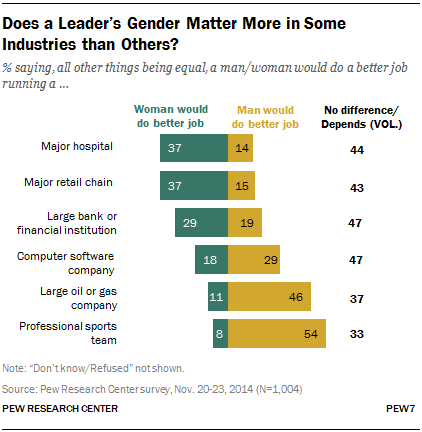 Opinions on gender and business leadership also differ across partisan lines. Democrats are more likely than Republicans to say that women do a better job on many of the characteristics tested in the poll, although in most cases majorities from each party say there is no difference between men and women on these dimensions. Some of the largest partisan gaps can be seen on which gender does a better job of being honest and ethical (37% of Democrats say women, 29% of Republicans say the same), providing fair pay and good benefits (37% of Democrats say women, 24% of Republicans say the same), and being willing to take risks (44% of Republicans say men, 30% of Democrats say the same). While the public believes that, in general terms, men and women are equally capable of running a business, that assessment changes somewhat when the question is posed about specific industries. Men have a clear advantage in two traditionally male-dominated areas: professional sports, and oil and gas. Some 54% of all adults say a man would do a better job than a woman running a professional sports team, compared with only 8% who say a woman would do a better job at this. An additional 33% say there is no difference between men and women in this regard or that it depends.17 Similarly, 46% of the public says a man would do a better job running a large oil or gas company, compared with only 11% saying a woman would do a better job. Some 37% say gender would not make a difference or that it depends. The share saying a man would do a better job running a computer software company is higher than the share saying a woman would do a better job at this. Some 47% don’t see a difference between men and women in their ability to run a software company or say it depends. Women have an edge over men in hospital management and in retail. Among all adults, 37% say a woman would do a better job of running a major hospital, while 14% say a man would do a better job at this. A plurality (44%) say gender doesn’t make any difference in running a hospital. The responses are nearly identical for a major retail chain: 37% say a woman would do a better job running this type of company, 15% say a man would do a better job and 43% say there is no difference or it depends. Women also have a slight advantage when it comes to running a large bank or financial institution. About three-in-ten adults (29%) say a woman would do a better job running this type of company, and 19% say a man would do a better job. Roughly half (47%) say it would not make any difference. Men and women tend to agree in their assessments of who could do a better job running companies in each of these industries. In the case of a professional sports team, women are somewhat more likely than men to say that a female leader could do better job (11% vs. 5% of men). However, even among women, half (51%) say a man would do a better job of running a pro sports team. Do Female Leaders Make a Difference? Many Americans see a broad societal value in having more women in leadership. Three-in-ten adults (29%) say having more women in top leadership positions in business and government would do a lot to improve the quality of life for all women. An additional 41% say having more female leaders would improve all women’s lives at least somewhat. About one-in-five (19%) say having more women in leadership would not do much to improve women’s lives, and 9% say it wouldn’t do anything at all. Women are much more likely than men to see potential benefits in having more female leaders. Fully 38% of women say having more women in top leadership positions would do a lot to improve the lives of all women; only half as many men (19%) agree. Similarly, Democrats are twice as likely as Republicans to say that more female leaders would be beneficial to all women. 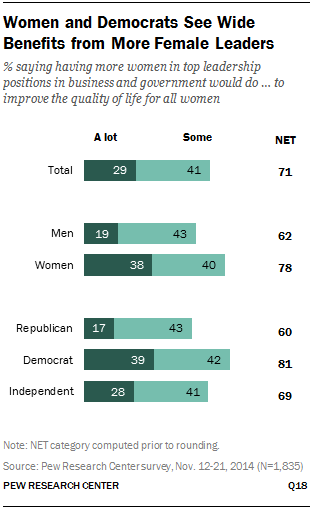 About four-in-ten Democrats (39%) say this would do a lot to improve the quality of life for all women. Only 17% of Republicans say the same. Independents fall squarely in the middle: 28% say having more female leaders would do a lot to improve the lives of all women.